Pay attention. When was the last time you actually took a good look at your frames? 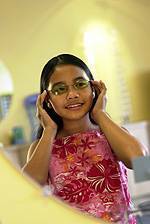 Periodically check your eyeglass frames to see if they are misaligned, and to test for loose screws in the frame arms. If the eyeglass frame looks twisted, or if your lenses seem to ride uneven on your nose, then it’s time to drop in on your eye care professional for an adjustment. In addition, many drug stores sell inexpensive eyeglass tool kits containing a small screwdriver and an assortment of temple screws for emergency repairs.